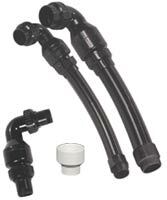 Navigate: StoreFront / Water Garden & Pond Products / Plumbing Supplies - Flex Pipe, Connectors, & More! TJB-INC carries all the plumbing supplies that are necessary for a water feature installation. From fittings to check valves, to piping, we have it all in stock and ready to ship. These products are the same types we use when we do our installations. Note: When you go to think about ordering piping or tubing, a good way to think about tubing size is to imagine drinking from a straw. If you were to try to drink a glass of water with a cocktail straw it would take much longer than if you were to drink that same glass of water from a standard size straw. Over the years we have developed a chart to help our customer's size their tubing. Please see below.